PISKY, Ukraine—The notion that the Ukraine cease-fire is still largely holding, or even being followed at all, is fiction. In the eastern Ukrainian village of Pisky, only six kilometers from the separatist stronghold of Donetsk, and two kilometers from the ruined Donetsk airport, the Ukrainian army 93rd Mechanized Brigade is engaged in sustained combat with combined Russian-separatist forces. 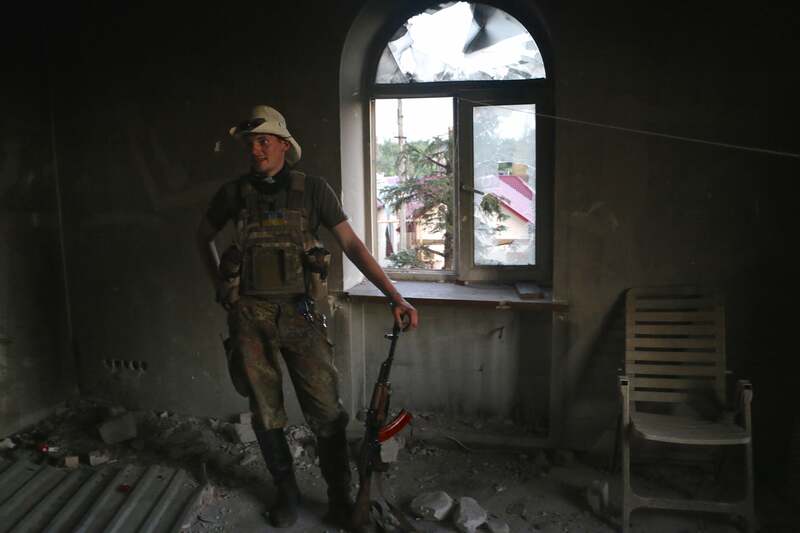 In Pisky, combined Russian-separatist forces violate the cease-fire every day with heavy artillery barrages, including 120-mm and 152-mm shells, tank attacks, and sniper and automatic grenade launcher fire. Separatist reconnaissance units also slip behind the lines after dark, and gun battles are a nightly routine. “I dance with death every day,” said Sergei Kozin, a red-bearded 43-year-old machine gunner from Dnipropetrovsk, who has been on the front lines in Pisky for more than two months. The Daily Signal was among the first foreign media outlets to embed with the regular Ukrainian army during an eight-day period in Pisky from June 8-15, 2015—it was the first time a U.S. journalist embedded with the regular Ukrainian army in combat. At about 3 p.m. on June 13, a separatist tank fired on a group of seven, including Ukrainian soldiers and this correspondent. The round landed about 60 feet from the group, and shrapnel sprayed overhead. Eardrums were left ringing. There were no casualties, and all seven were able to flee to a nearby cellar to take shelter for the follow-on shots that lasted for about 20 minutes. Ukrainian forces firing unguided shoulder-launched anti-tank missiles turned the tank back. Ukrainian soldiers involved in the fighting claimed it was a Russian T-72 tank, although this could not be independently verified at the time. Facing these persistent, lethal attacks, the Ukrainian forces are forced to defend themselves by bringing up heavy weapons banned from the front lines under the Minsk II agreements, resulting in a complete collapse of the Feb. 12 cease-fire. “We have orders to fire only if we are directly under fire, only if they are trying to take our position,” Kozin said. The separatist artillery barrages are relentless and are coupled with daily tank attacks and persistent sniper fire, making Pisky a deadly place for Ukrainian soldiers who are hunkered down here to prevent a separatist breakout, which they fear would sweep across eastern Ukraine. 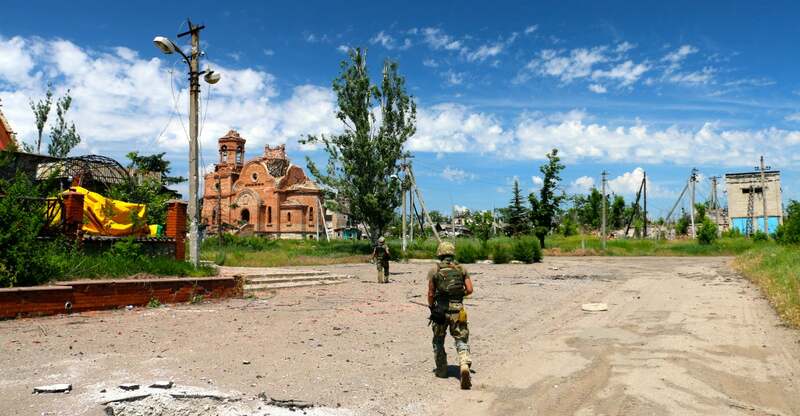 On June 3, combined Russian-separatist forces launched an offensive against Ukrainian troops nine miles southwest of Pisky in the nearby town of Marinka, also on the outskirts of Donetsk. The attack comprised more than 1,000 troops who were supported with heavy weapons and tanks. Ukrainian troops ultimately held their ground and repelled the attack, but they initially had to do so without heavy weapons support. It took almost six hours to redeploy Ukrainian artillery and tanks, which had been pulled back from the front according to the Minsk cease-fire, to support the embattled troops defending Marinka. Ukrainian soldiers in Pisky point to Marinka as proof that the combined Russian-separatist forces have abandoned the cease-fire. They say heavy weapons need to be on the line ready for Ukrainians to use due to the looming threat of a Marinka-style offensive here. The cease-fire is dead, they say, and to stay on the line without heavy weapons deployed nearby to protect them in an offensive would be suicide. “We can’t fight off Russian tanks with Kalashnikovs,” Kozin said. 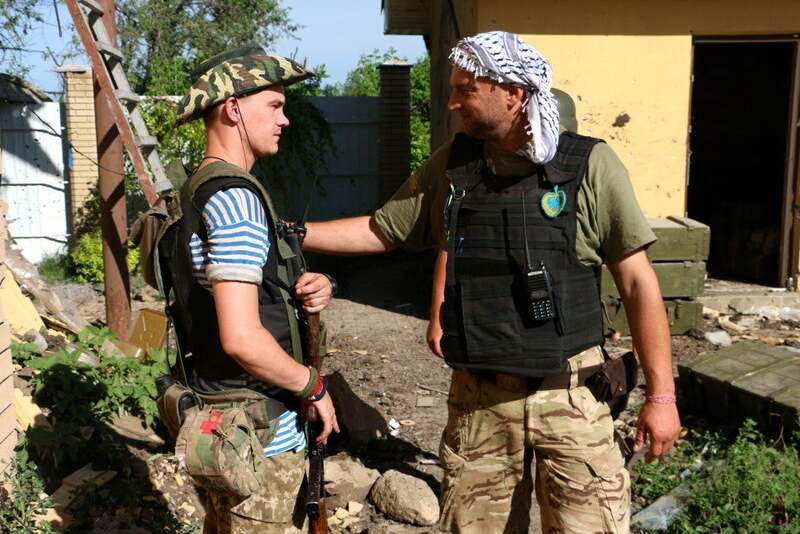 The Ukrainian army anticipates a major assault in Pisky will happen soon. Combined Russian-separatist tanks attack Ukrainian positions almost every day. The artillery is virtually nonstop and around the clock. Ukrainian soldiers say they start to feel uneasy if the firing stops for more than an hour; they are so used to the constant concussions coming at irregular intervals that total silence is disconcerting. During a tank attack, the rounds came in with no notice, hammering a Ukrainian position for a half-dozen or so strikes. Tank shots are harder to anticipate than artillery fired from fixed positions because the shell arcs are usually flatter, leaving a shorter whistle before the round impacts. Soldiers consequently have less time to react and dive for cover. Each day, Ukrainian soldiers repel separatist tanks with shoulder-fired anti-tank missiles and with armored personnel carriers. The Ukrainians consider the attacks to be probing missions designed to test the Ukrainians’ defenses, rather than attempts at an actual breakthrough. The Ukrainian retreats at Debaltseve and Illovaisk, in which hundreds of Ukrainian soldiers were killed when their positions were surrounded and overrun, have Ukrainians on edge about their prospects of survival in a retreat. Many vow to fight to the death if they are surrounded in Pisky rather than being taken prisoner. On the night of June 13, Ukrainian troops received information that a combined Russian-separatist offensive would likely happen that evening. The mood was tense throughout the night, and units were placed on combat alert. 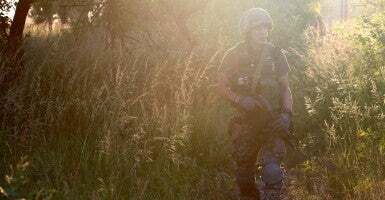 Daniel Kasyanenko—nom de guerre “Mobile Phone”—a 19-year-old soldier from the southeastern Ukrainian town of Zaporizhia, said that if the order were given to retreat, it would have to be done on foot. “We don’t have enough cars to drive us all out,” he said. Pisky is a formerly wealthy suburb of the separatist stronghold of Donetsk. From here, Ukrainian forces fired artillery in support of an elite unit nicknamed the “Cyborgs,” which fought for control of the Donetsk airport through January. The airport, which was totally annihilated by the fighting, is currently under separatist control. 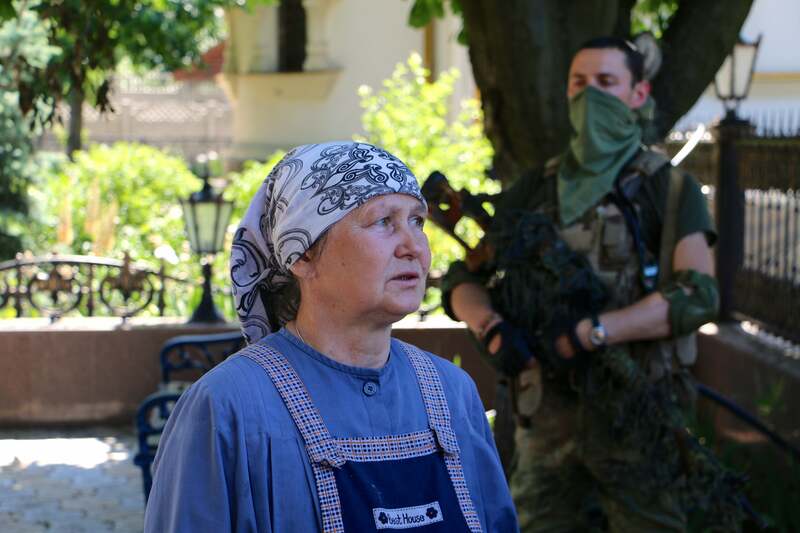 Initially, Ukrainian units in Pisky comprised both civilian volunteer battalions and the regular army. But after a push by Kyiv to consolidate all the volunteer battalions fighting in the conflict area under government control, volunteer soldiers in Pisky from groups like OUN, Right Sector and Karpatska Sich have been integrated into the 93rd Brigade. The 93rd currently comprises both volunteer and mobilized soldiers. Pisky is a devastated wasteland. The ground is littered with craters, Grad rockets and charred earth. Every building in the village is at least partially destroyed by the shelling; shrapnel and bullet holes pockmark almost every vertical surface. A few civilians remain, but most have left. An Orthodox nun remains at the local church as caretaker. She brings out chocolate and bottles of water to Ukrainian troops passing by on patrol, and opens up the church for them to pray. The Ukrainian units based in Pisky have set up positions in the cellars of the most solid structures, hoping to find a modicum of protection from the artillery. Ringing the village is a network of trenches—reminiscent of scenes one might associate with World War I—where the Ukrainians have set up machine-gun positions and snipers work. Looming off in the distance one can see the Donetsk skyline. There are two tall, white towers from which snipers fire and artillery spotters can see almost 30 kilometers, Ukrainian soldiers claim. The structures are too close to civilian positions for the Ukrainians to try to destroy them. For many Ukrainian soldiers, direct Russian involvement in the conflict is a forgone conclusion. Some of the tactics the combined Russian-separatist forces use contribute to the enmity the Ukrainians feel toward their enemy. In addition to 120-mm and 152-mm heavy artillery, the combined Russian-separatists also shoot flares and white phosphorous rounds at structures. At night, targeted buildings go up in flames. The white phosphorous rounds are capable of burning straight through the concrete walls of the cellars within which the Ukrainian troops take shelter, potentially killing them while they sleep or eat. The separatists, who share the same radio waves as the Ukrainians, often taunt the Ukrainians in radio messages. The Ukrainians, for their part, laugh at the panicked radio calls of separatists under fire—especially one call in particular, in which the separatists confused artillery fire for bombs dropped from an aircraft. 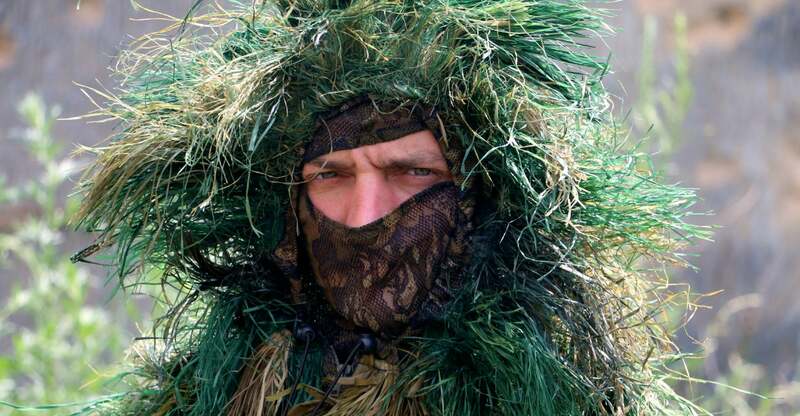 Humor and camaraderie are often the bedrock of the Ukrainian soldiers’ psychological grit. “Our comrades help us endure the fear,” Kozin said. “When our smiles disappear, we disappear,” said Nemo, a 39-year-old from the Crimean city of Kerch who has been on the line for more than five months. Soldiers are constantly laughing and smiling—almost purposefully during moments of intense danger. “Sometimes we laugh, but it’s bitter laughter after the shelling,” said Oleg, 43, from Kharkiv. “But it’s not very sweet moments when there is shelling. 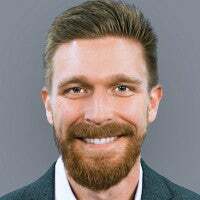 “Optimists will survive a lot longer in a war,” said Bogdan—nom de guerre “Dan”—a 25-year-old from Lviv with an anchored smile who likes to ride around Pisky in an old motorcycle he has fixed up while wearing a cowboy hat. 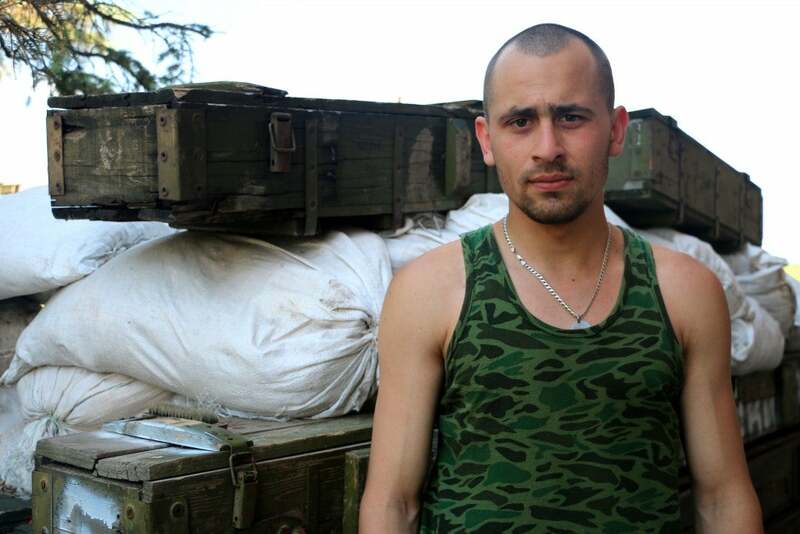 Like many Ukrainian soldiers, he’s trained in multiple specialties, including as a sapper and medic. Pranks play a key part in preserving the soldiers’ morale. Once, Bogdan said, they called a pizza delivery joint in Donetsk. When they gave the address in Pisky, it was nothing but dial tone. And during one particularly intense firefight, the soldiers called the Donetsk police department to report a disturbance of the peace. “They didn’t think it was so funny,” Bogdan explained, smiling. While many soldiers outwardly treat the constant artillery barrages, tank attacks and sniper shooting with casual indifference, they privately admit that the near-constant fear of death is psychologically draining. The artillery attacks are indeed terrifying. The whistle of the incoming rounds often gives one second, at most, to dive for the ground to avoid the shrapnel. 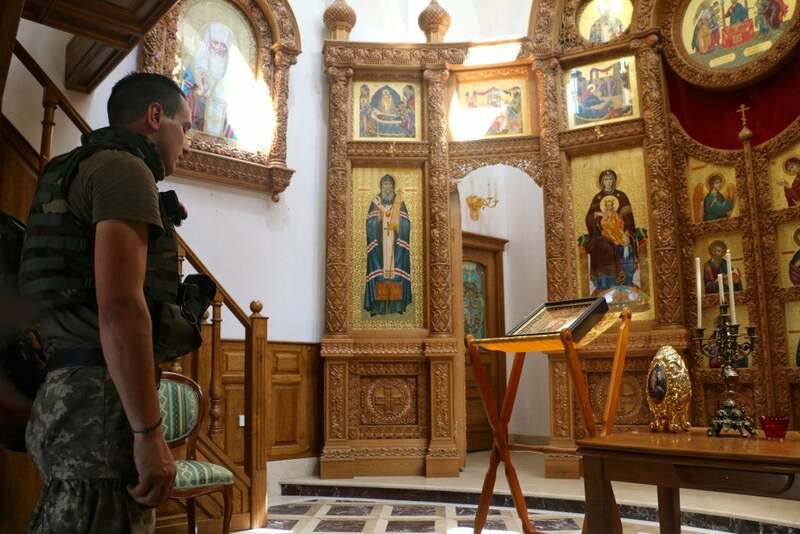 “I always feel fear,” said Kostya Bezkorovayny, a skinny 22-year-old from Dnipropetrovsk who is always smiling (his nickname is “Smile Man”) and wearing shorts and sandals—even in body armor. “But you eventually learn to tell apart the really dangerous things from the things that are just scary,” he added. 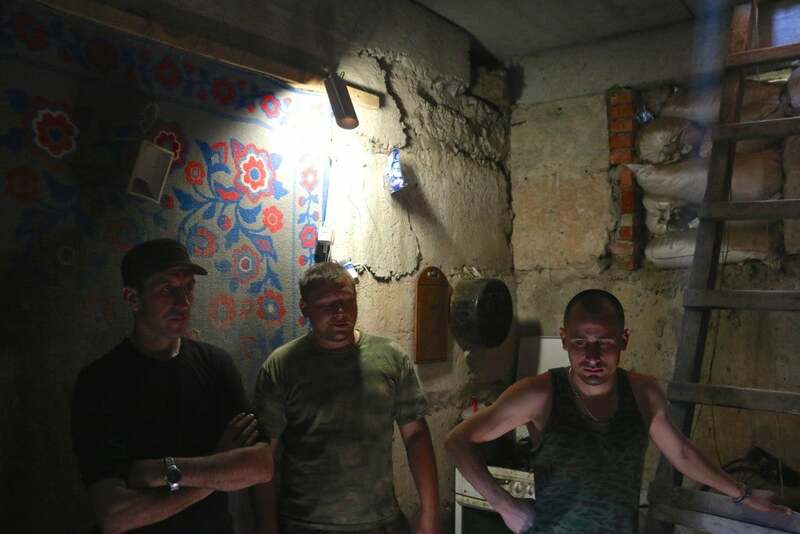 Often times, however, Ukrainian spotters on the front lines are able to see enemy artillery being fired and transmit a radio message—they say “hole”—giving soldiers enough time to find an underground cellar in which to hide. Soldiers walking around usually carry radios, reflecting the reality that even a simple trip to the outhouse could turn into a life or death sprint for safety. The unending sniper attacks are another concern. The laser-zip sound of bullets flying overhead (like a fingernail running down stretched nylon) and the crack of far-off sniper rifles firing is almost constant. Sometimes the Russian-separatist snipers time their shots with automatic grenade-launcher attacks and artillery, concealing the sound of their shots, which could give away their positions. 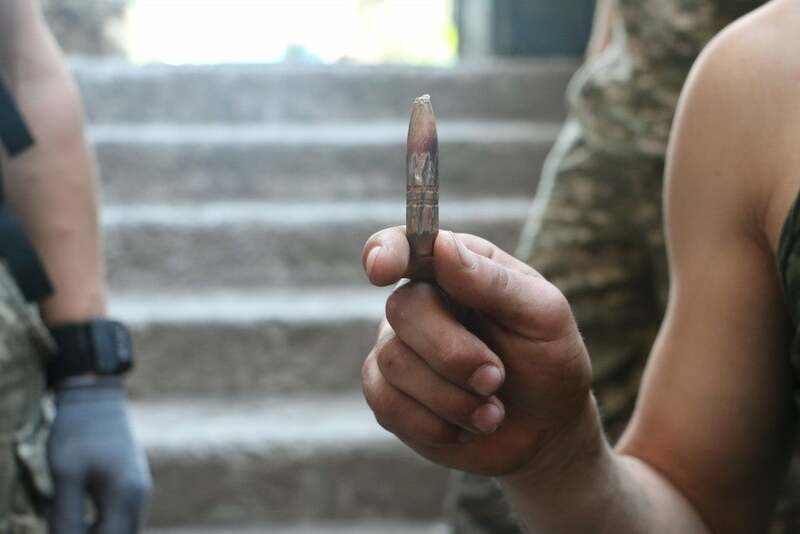 No casualties due to snipers were recorded while The Daily Signal was embedded in Pisky, but there were multiple instances of sniper rounds impacting only inches from both Ukrainian soldiers and journalists, underscoring the constant threat. Walls devastated by artillery shrapnel are also littered with 14.5×114-mm caliber sniper bullets. The whistle of bullets flying overhead is not unusual in Pisky, but still, everyone ducks when they hear the sound. Snipers, like drones, instill a unique fear in the soldiers. Despite the tough living conditions and the relentless attacks, the overall morale of the Ukrainian soldiers in Pisky is high. “It’s impossible not to be motivated when the enemy has attacked the motherland,” said Ivaskiv, whom the soldiers call Vasha. He volunteered for the military after traveling back and forth to the front lines driving supplies to soldiers. He was tired of seeing young men die, he explained, and wanted to fight for his country. He said he had to step over his pleading wife who tried to block the door when he left for the war. He has a 31-year-old son whom he doesn’t want to join the military because the son is childless. “A man should have children before going to war,” Ivaskiv said, explaining that his father, who was born in 1913 and fought Nazi Germany in the Second World War, told him the same thing when he was a young man. Konstantin Bernatovich, “Koha,” a 33-year-old television production engineer from Kyiv, beams with pride when he shows photographs of his twin 13-year-old boys. “All I care about is getting home to see them again,” he says. He is scheduled to return home for their birthday this summer, but he will only get two days off from the front. Many soldiers have been on the line for as long as six months, and the psychological toll of the constant shelling, and the indiscriminate, myriad ways in which one can die in Pisky, eventually breaks some. One soldier voluntarily turned himself into the military police for drinking so that he could spend three days in the local brig to decompress after an intense firefight. “We’ve had people go insane from artillery,” said Volodymyr, a sniper, who is married and left his job at an Obolon beer factory to join the 93rd. “Sometimes the Russians fire multiple shells at the same place at once so the concussions resonate like an earthquake,” Kozin said. Many of the men are more frustrated with not being able to attack the enemy than by the day-to-day dangers—they are eager for large-scale operations to resume so that they can escape the lethal drudgery of this static, long-range type of combat. One afternoon, Ivaskiv held Dina down, and while she whelped in pain he extracted a piece of artillery shrapnel from her neck with his bayonet knife. Dina accompanies the unit on patrols, and she sleeps in the cellar with the men at night. She becomes very frightened when the artillery starts up, and often hides under the dinner table by the soldiers’ feet. Meals, for that matter, are special occasions. At night the soldiers laugh and joke over dinner. The food is simple, hearty fare, cooked on a small gas stove. They sometimes cook fish, which is caught from the nearby stream, mixed with rice, potatoes or barley. Every now and then they get a little lazy and use extra explosives to bring up the fish, but mostly they do so with lines. Soup, salad and bread are almost always served at meals. So is salted salo—a Ukrainian specialty made of cured pig fat. The men sometimes eat salo and sweetened condensed milk for energy before long missions. Eggs are for breakfast, and lunches are usually drawn out as a way to escape the summer afternoon heat. Special occasions, such as the birthdays of children, call for chicken cutlets that volunteers have brought in. There is also a special compote juice, which volunteers bring in big glass jars with berries in the bottom, which the men drink with abandon. Nearly everyone smokes, more from Ukrainian cultural habits than anything specific to the war. But there is a natural, collective need to light up after a heavy artillery attack or a close call with a sniper. Civilian volunteers bring all the food. 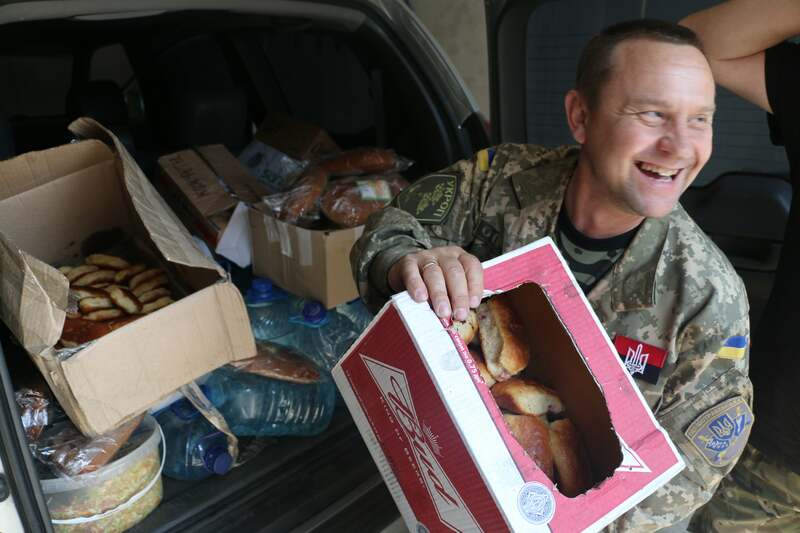 The Ukrainian government sparsely supplies the soldiers. 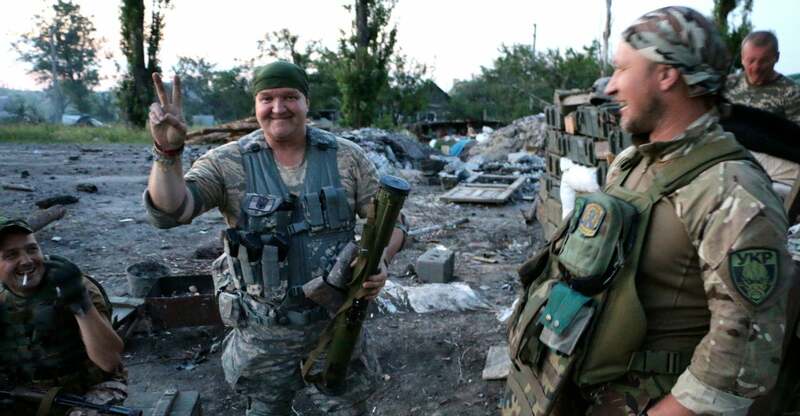 Many Ukrainian troops sarcastically claim that the government in Kyiv only gives them guns and ammunition. Reality is not too far off from these typically sardonic battlefield complaints. The Ukrainians wear mismatched uniforms that often have either been bought off the Internet or sent by friends or family. Most are still equipped with winter gear, and therefore go on patrol in T-shirts to avoid the summer heat. Uniforms, boots, body armor, food, water, first aid kits, cigarettes, rifle scopes, night vision goggles (designed for hunting, not war), portable devices for plotting enemy artillery—it all comes from civilian volunteers who raise money to buy these things and then drive them to front lines in old, bullet-riddled minivans or SUVs.